If you’ve been reading or seeing the news lately, our friends in the northeast are getting pounded with so much snow that the government is actually issuing a mandatory curfew. In some areas, the curfew is so strict that if someone is caught breaking it, they are immediately arrested! Have you ever thought about what you would do if something similar happened in the area where you live? What if a flood overtakes your subdivision? What if a tornado rips through your community? You need to ask yourself one vital question: “Am I going to be able to feed myself or my family if a disaster strikes?” Are you prepared to survive for at least 24 hours on your own while waiting for help to arrive? We want to help you with that. This checklist is for one person, so if there is more than one person in your household, plan accordingly. If you follow this basic guide to packing and storing your 24 hour emergency kit, you’ll be prepared for most any disaster that comes your way. When preparing for a potential disaster, you’re always going to need items in your 24 hour kit that can keep you warm and dry. You can’t afford to use your food as fuel to burn. You also can’t expect crackers to stop the bleeding when you get a cut. Here are some non-food essentials that you definitely need in your kit. Emergency Blanket 1 $3.99 It needs to specifically be an emergency blanket. Any normal blanket won’t work as well. Emergency blankets are made with reflective polyester to contain your body heat. They’re also waterproof and lightweight which makes storage easy and safe. Glow Stick 1 pack $4.99 When the lights go out and it’s dark, you’re going to need to be able to see. Glow sticks provide comforting light to not only help you get around, but also help others, like potential rescuers, see you and get to you faster. Survival Whistle 1 $5.99 Speaking of helping rescuers find and get to you quickly, if you are trapped and get outside, grab your survival whistle and start blowing. Help is most likely on the way. The easier you can make the job of a rescuer, the better. Waterproof Matches 1 box $4.99 If it’s cold outside or it’s night time, you’re going to need a fire. 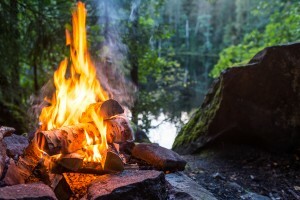 Fire not only helps keep you warm but it can help you cook, act as a signal to potential rescue teams, and serve as a comforting presence if you are by yourself. The last thing you need is for your fire source to get ruined by water, so make sure your matches are waterproof. Hand Sanitizer 1 bottle (30 fl) $3.50 Hand sanitizer isn’t just for keeping your hands clean. Think about what’s in hand sanitizer. Alcohol. What does alcohol do? Kill germs. Rub it in to help clean wounds. Alcohol is also flammable, which means you can start a quick fire with your matches if you need to. Sewing Kit 1 $8.25 Clothes and blankets will rip in sticky situations. It’s good to be able to have the tools to fix rips and tears if you need to. Sewing kits also serve as emergency sutures when deep cuts are sustained in accidents. Painful? Yes. Worth it? Yes. Duct Tape 1 roll $3.50 We’ve all heard the phrase “duct tape can fix anything,” and it’s the absolute truth. Broken back pack strap? Duct tape it. Water leak in your containers? Duct tape it. Duct tape is also an invaluable emergency medical tool. You can use it to stop bleeding in deep cuts and also create splints for broken limbs. The important thing to remember when packing food for your 24 hour emergency kit is that this food is for emergencies. In an emergency, it’s not going to matter if you have mustard and ketchup, so don’t get too picky. In reality, every person’s food item list will be different because everyone has different tastes. The following item suggestions are ones that are universal and guaranteed to keep for a long time while being stored. Saltine Crackers 1 Box $2.50 One box of saltines contains four sleeves. You can break these crackers up into soups or chilis to make them more hardy. You can spread peanut butter on them, or you can have them around for a convenient snack. Canned Chili 4 Cans $4.00 There’s one vital thing that you’re going to need in an emergency. Protein. Protein gives your cells the energy they need to function properly and chili, because of the means and meat, is packed full of protein. Plus it sticks to your bones making you feel full for longer periods of time. Peanut Butter 1 Jar $4.50 Peanut butter is one of those kinds of universal products that you can do almost anything with. It keeps for a long time and, like chili, it’s very hardy. The longer you can avoid hunger, the better. Peanut butter is a vital tool to keep hunger away. Canned Tuna 4 Cans $5.00 Tuna is another great protein source that you’ll need in your kit. Canned tuna stores for a long time and can be used in a wide variety of emergency meals. Make sure it’s stored in water and not oil. Tuna in oil can spoil faster. Nuts 1 Jar $6.00 Nuts are another great snack item to have in an emergency. For all of you vegans out there, they are also another great source of protein that your body will need. Mixed can give you some much needed variety, especially if you’ve eaten the same things over and over again. Purified Water 8 liters $4.00 If there’s one thing that you will absolutely need in your 24 hour kit it’s water! Always store more water than is necessary because you will be surprised how fast you go through it in just one day. Canned Fruits 4 Cans $4.00 Besides providing essential vitamins, fruits provide natural sugars that can give you energy when you need it most. Canned fruits keep for a long time so you won’t have to worry about them going bad on your shelf. The key thing to remember when preparing your 24 hour kit is to keep your physical surroundings in mind. If you live near a water source, you may want to include water purification tablets in your kit so you have an unlimited water supply. If you live in a desert, double your water storage amount. If you live where it snows, focus on keeping warm. No matter what you choose to keep in your kit, make sure that you store it in a dry place where no animals or water can get to it and spoil all of your hard work.